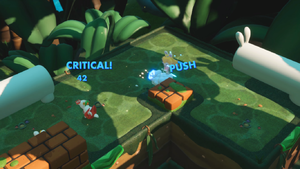 Push is a volatile status effect in Mario + Rabbids Kingdom Battle. Depending on the weapon used against them, the inflicted character will be pushed a few cells in the direction they were shot, ignoring battlefield boundaries and inflicted with an "out of bounds" damage bonus should they travel out of bounds. Like the similar Bounce status, inflicted characters are vulnerable to "line of sight" techniques. This page was last edited on February 8, 2019, at 20:54.